The Massachusetts Ploughman was an agricultural newspaper published in Boston that provided reading material for a number of Ameses. It was probably subscribed to by Old Oliver, who maintained an interest in farming that he couldn’t seem to pass on to any of his children. Although the Ames shovel business had helped turn once-rural North Easton into a productive, if small, industrial village, agriculture still ruled the show as the “largest single sector of the economy even in the highly commercial states of Massachusetts and Connecticut.”** Most people still farmed, raised livestock, worried about bringing in the hay, and looked for guidance from experts such as those behind the Ploughman masthead. Evelina turned to the paper for recipes. It may have been St. Patrick’s Day, but no celebrating would have gone on in the Ames compound. At the factory, however, things might have been different. Thirteen years from this date, in the middle of the Civil War and less than a year after Old Oliver’s death, Oliver Jr. would note in his diary that on “St Patricks day did not run Engines in Shop.” Was that also true in 1851, or did Old Oliver’s animosity toward the Irish preclude such an indulgence? 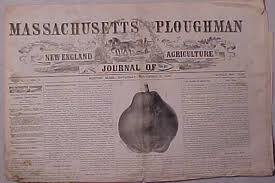 * A late-19th century copy of the Massachusetts Ploughman after it merged with the New England Journal of Agriculture. The morning could be as here. If I were to wash clothes, it wouldn’t be a great day to hang them out.